Tilapia is a soft, white fish with a delicate, light taste that will assume the flavor of any herbs and spices used to season it, as well as any marinades used beforehand. Tilapia is widely available in frozen form in many different venues, and can commonly be found fresh in fish markets and in some grocery stores. Tilapia pairs well with dry, white wines with just a hint of citrus fruit flavor. Allow the tilapia to defrost in the refrigerator for up to 36 hours if it has been previously frozen. Pat the pieces of fish dry with paper towels until all moisture has been removed. Lightly brush both sides of the fish with extra-virgin olive oil or a combination of extra-virgin olive oil and unsalted butter. Sprinkle sea salt or kosher salt and freshly ground black pepper on the fish along with any fresh or dried herbs you wish to use. Cover the fish with plastic wrap until needed. Heat the grill over high heat for about 20 minutes with the top down or until the grill is extremely hot. Lightly brush the grill surface where you will be putting the fish with extra-virgin olive oil. Grill the tilapia for five minutes on the first side without flipping or moving the fish. Flip the tilapia over with a fish spatula and cook it for an additional five minutes. Remove the fish from the grill and transfer it to a large serving platter or individual plates. Allow the fish to rest for five minutes before serving. Common herbs for tilapia include herbes de Provence, dill, thyme and oregano. Fresh citrus juice, ginger and garlic are also routinely used to flavor tilapia. You can marinate tilapia in a wide variety of different liquids, herbs and spices for as little as one hour or as long as 24 hours before cooking. For grilling, it is best to pat the fish dry before cooking to avoid steaming the fish at the same time. 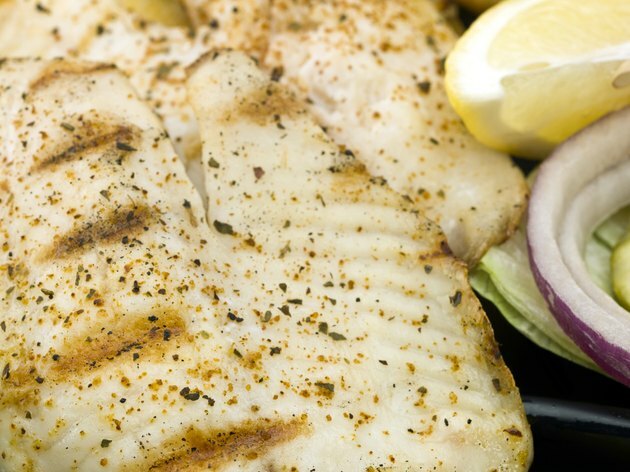 If you are cooking tilapia fillets larger than one-inch thick, they will need to cook slightly longer on each side. However, most tilapia fillets are not larger than one-inch and smaller fillets won't be hard to find in a grocery store or through a fishmonger.